i think think this one was 5x7" or 8x10"
collapsed at work. 3 or 4x. trouble breathing. throat closing up. trouble talking. could not walk to car. had to be carried. given nebulizer treatment, chest xray, iv fluids, ekg. potassium low but the rest ok. they think it was anxiety but i think my body was having a negative rxn to something. they gave me a shot of steroids, 2 xanax, and sent me home. thanks to my wonderful coworker angela and my friend janusz for providing TLC. i've lost my faith in my ability to function. this is a close-up of the journal i blogged about in the previous post. here you can see the patterns i achieved using for the most part just 2 sizes of beads in the same matte blue color with iridescent scene. 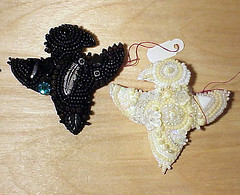 likewise the patterns on the crow's body were accomplished using 2 sizes of beads in the same color. 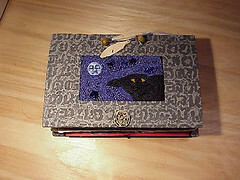 another raven.. this is a hand bound journal i made. 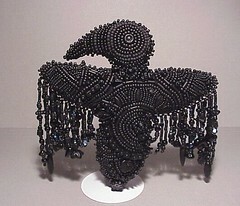 the inset of the cover was also hand beaded, using seed beads, pressed glass beads, and a dyed carved bone face. the charms in the binding were made of carved bone feathers and real acorns. the binding was coptic stitch, so when open the journal lays flat. i made this a number of years ago. another raven to share. this one was done a number of years ago. i believe it was 5x7" or 8x10", but i must have sold it since then. 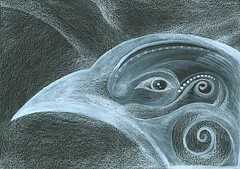 it is white colored pencil and white gouache with white ink on black art paper. 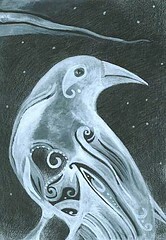 some cultures have a myth that the raven used to be a white bird. there is always a story to account for how be became black. and sometimes albino ravens are born, which perhaps led to the myth in the first place. i am posting this for camilla. this is a raven doll i made several years ago. it is 4" tall, beads sewn on ultrasuede. if you click this image it will take you to my flickr page where you can see a few other images of the doll. the reason for now posts, no pretty pictures..
i have been under the weather.. well, for about a month. then it got worse about a week and a half ago. and even worse about 6 days ago. then i went to the doctor today. he sent me to the ER. where i got some meds and what i really needed - 2 units of fluid. gravity was not working fast enough for them so they decided to pump it in which felt very odd. but i felt better after i had it. i was really dehydrated and still feel dehydrated but that did help. i don't really know what is wrong, presumably it is "just" a really bad IBS flare-up, the worst i have had in years, and did not respond to the things that usually help. did not respond to anything i could do for myself. the doctor thought maybe i just got so dehydrated that it was making me feel sicker and sicker and i felt to sick to make myself drink, to say nothing of eat. so i am trying to get some fluids this evening. and i have a note to miss the week of work, which is terrible timing, but then i worked 4 days last week, feeling miserably ill, and just kept getting worse. i actually collapsed at work twice on thursday but still stayed late and made it to work friday. anyway. 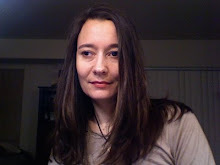 i think i am on the mend now and will check in with my doctor again tomorrow and continue to take it easy. all i have done is read and sleep and today, go to drs and pharmacies. it was weird to see the valentine's stuff on sale because it had not really hit me that that holiday had passed us by. really the last 5 or 6 days are a bit of a blur. i was nervous that both my mother and sister are traveling without cell phones right now and i had no way to reach either of them. they are the only 2 blood relatives i would feel comfortable entrusting my medical care to, should anything go wrong, and of course i had to put someone down for emergency contact. well, i would feel comfortable entrusting my stepfather but he's not a blood relative and might not feel comfortable himself. though presumably he knew how to reach my mother so i suppose it would have been ok.
so that's my not-very-interesting news. and maybe i will have some art some other day, but yet. 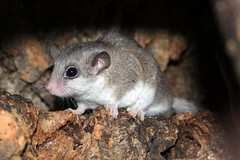 dormice sleep for up to 6 months a year, or even longer if the weather is cool. occasionally they may wake up for a little snack and then it's back to bed. i intend to apply for dormouse status. i believe october to march would be sufficient for my purposes. well, maybe october to april. source: wikicommons, used according to policy. 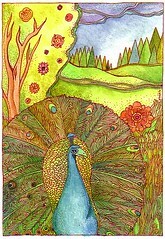 here is one from the archives.. ink and watercolor on watercolor paper. 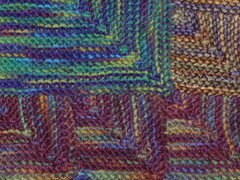 the original is 5x7" i did this in 2007.
i am still working on the modular scarf. i decided to mix it up a bit with different sized squares. 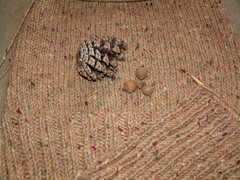 this is what i am knitting right now. i am trying to finish up some of my in-progress projects. i wish i had more time to do art, but between work-stress and having had some health issues this month i have not gotten much done. you know, i am sure, sometimes you come home from a rough day and you just cant get yourself to do art! well, i'll keep trying. i might do some watercolor later today. or maybe i will knit more..